Hello all. Much to my surprise, this “little” project of mine has been much more exciting (and much more work) than I ever imagined. I’m having an absolute blast living in and writing about the world of Bond, so I’ve made the foolish decision to give myself more work by expand the goals of the site slightly. This Friday, my poker buddy and dear friend Clark linked to Blog James Blog from the Entertainment Weekly website as part of the cover story “Goodbye Mr. Bond.” First off, thanks mate, truly appreciated. In his post, Clark points out that I’m taking my time with the project. The truth hurts. Not as bad as when Clark takes down a pot with an unsuited 7-2, which he does more often than you would think possible, but yah it hurts. That said, I put an incredible amount of work and time into producing the film write-ups (I will not get into detail because I’m sure you don’t care) and I feel if I were to speed up the process for the sake of more frequent posts, the work would suffer. So, using the EW cover article as inspiration, I’m going to open a For Your Eyes Only category of the blog. These posts will be shorter (much shorter) posts, hopefully in a similar voice to the film posts, on Bond related news, both in the press and on a personal level. So, with out further ado, the inaugural For Your Eyes Only post, my thoughts on this weeks EW cover story. (Ed. Note: If you’re computer self destructs after reading the post, blame Steve Jobs.) And stay tuned, On Her Majesty’s Secret Service (1969) will be posted in the next two days. Promise. 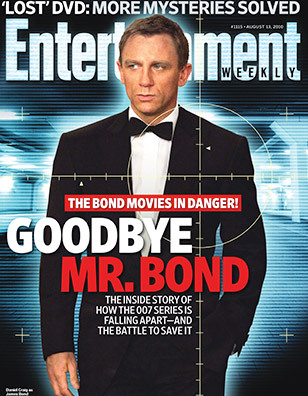 For the August 13, 2010 issue, Entertainment Weekly, a publication partnered with a big movie studio (Warner Brothers) printed a cover story celebrating the death of another big movie studio (MGM). The largest property MGM owns (actually co-owns along with EON) is the 48 year-old, 22 film franchise, James Bond. The studio is $3 billion in debt and as a result they have all but stopped producing new movies including Lord of the Rings prequel The Hobbit, RoboCop, Red Dawn and as cover boy Daniel Craig illustrates, James Bond 23. The cover promises “The inside story of how the 007 series is falling apart – and the battle to save it” Awesome, the nets been silly with rumors for months so I’m dying to know “What’s up with Bond 23?” Six pages later I learned the following, no one knows and no one is talking. Hummm, bit of a let down. Basically the film was scheduled to start shooting this summer (we knew that) but now who knows? Sam Mendes was to direct (we knew that) but now who knows? Craig was set to star (we knew that) but now who knows? 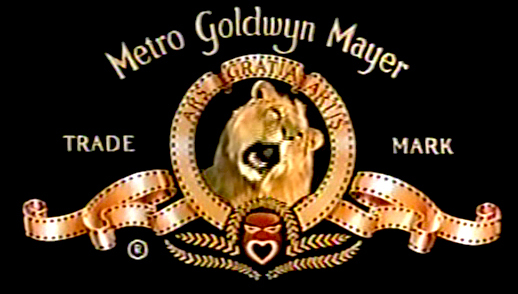 MGM is screwed (we knew that) and one of two things could happen; (1) The studio gets brought out by another studio and EON (controlled by Cubby Broccoli’s daughter Barbara and step-son Michael Wilson since 1995’s Goldeneye) deals with that studio or (2) MGM goes bankrupt and all bets are off. But who knows? I couldn’t be more grateful on a personal level for the cover story because it gave Clark and excuse to link to Blog James Blog and traffic increased by several magnitudes. Hopefully some of those folks will come back. But as a story, I found the article lacking, and it certainly didn’t del iver on the promise of an inside story or what’s being done to save 007. Anyone with any kind of knowledge refused comment and that might speak louder than anything that was written. One thing you can bet on is entertainment executives never pass up a chance to talk up their product, unless there is nothing good to talk about or a possibility of a lawsuit; in this case, most likely both. With Bond in so much trouble we would expect them to talk, but maybe they expect Mr. Bond to die.